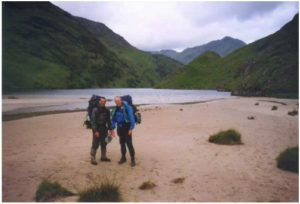 Both in 2001 and 2002 we hiked the Scottish Highlands, our favorite hiking and training destination, close to home. The weather is miserable, the mosquitoes and black flies eat you alive, but nevertheless, this place is magic and you never get enough of it! “Altitude” doesn’t seem to be an issue in the Highlands. 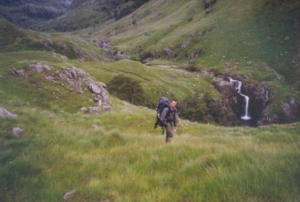 But climbing1200 m from sea level, on a muddy and slippery surface with a 25kg heavy backpack can be a challenge at times! In Scotland they have a saying: “If you don’t like the weather, wait 5 minutes”.